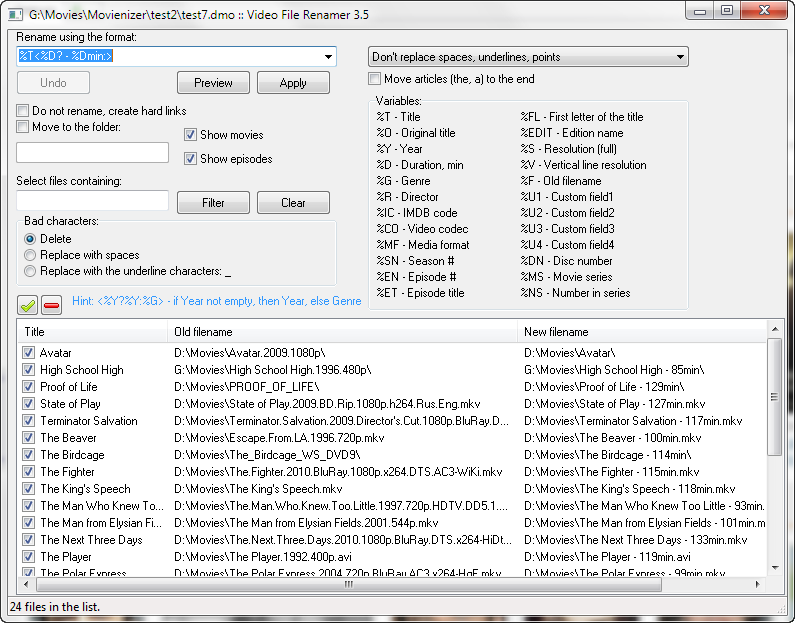 Rename video files easily with this plugin for Movienizer. Video File Renamer is an additional module for Movienizer that can rename video files using information from your Movienizer database. Thus your complete collection of video files can be renamed automatically, using a pattern of your choice. The plugin also updates links to files in your Movienizer database, which gives you yet another advantage: if you rename your files manually, you will need to update links in your database manually, too. The plugin will show all filenames from your database in its list, like on the first screenshot. Variables are shortcuts for field names. For example, %T will be replaced with the movie title, %O is for original title, %Y – year etc. The complete list of available variables is shown in the "Variables" area of the plugin. If there are several movies in your collection with 2009 as their release year and titles starting with A, all of them will be saved to this folder after renaming (condition: before renaming these files should be stored in the same folder, or you are using the option of moving files to a certain folder). You can easily sort your collection of video files using this feature. A hard link looks like a copy of the file. However, it does not occupy any additional space, as it refers to the same data. Thus you can have the same file in several locations. Later you can remove the original link or any new ones without losing the file (it will be available as long as there is at least one link). Hard links cannot be created for folders (DVD, Blu-Ray), such folders will be renamed. If you need to rename files only from a certain folder, for example, from "MoviesToRename", enter "MoviesToRename" into the filter field and click the "Filter" button. This will remove the rest of files from the list, making it easier to select the ones you need to rename. Several filters can be applied, one after another. To cancel all filters, click "Clear". This does not look nice, and you'd probably like to use Avatar.avi instead. However, manually selecting all movies that have empty fields could be time consuming. if there is no codec information. Thus information inside "<" and ">" will be disregarded if the corresponding field is empty. Does it look scary? No, its meaning is pretty simple: if the original title field is not empty, use original title, else use title. if duration would be 0 (well, it's a purely hypothetical situation; if there is a playable video file, it will surely have some duration). Hint: Clicking the “Preview” button does not change anything, allowing you to preview what your filenames will look like, so feel free to experiment.